Under a lurid green sky, my feet sinking into foul trench mud, I am faced with poetry. It marches down and over me. It waits to be noticed in the medical tent. It whispers its truths from every ghostly mouth. 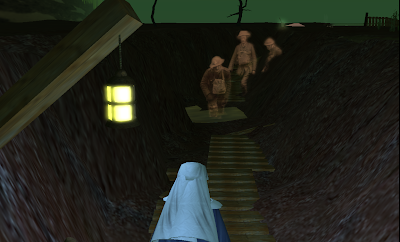 Thanks to a tip from Prim Perfect editor Saffia Widdershins, I traveled to the WWI Poetry sim, and found myself surrounded by the powerful combination of virtual experience and literature. A collaboration of The First World War Poetry Digital Archive and the Learning Technologies Group at the University of Oxford, the region's goal is to place "the poetry of the Great War in context, allowing the visitors to the exhibition to visualise archival materials in an environment that generates deeper understandings and to take advantage of the social and interactive aspects that the environment offers," according to Stuart Lee, Lecturer of English at the University of Oxford. 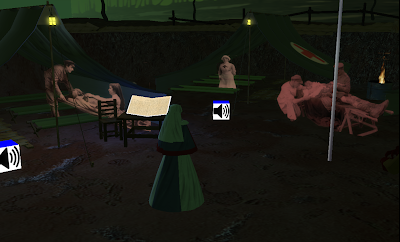 I began my journey in the training camp, listening to a soldier speak as I walked among the tents. Passing through the trenches, I followed builder CSteph Submariner to the medical tents, where Sigfried Sassoon and Vera Brittain waited. Poetry and history twine throughout the region, waiting to be discovered. Beyond the medical tents, the front line beckons and I will return there this evening. It is haunting to hear these poems in place, surrounded on all sides by the sights and sounds of the Great War. As an educator, it is thrilling to see, and to imagine how this project, and many, many others like it, could enrich the study of literature and connect writers and readers across generations and experiences in a new way. When you go, please respect the region's atmosphere and the experience of other participants by wearing the clothing provided at the landing area. I will be alerting my students to this. It's the sort of immersion we want at Usher, Viv. agreed! I thought of your students immediately, as they have the know-how to get the most out of the experience. From the BBC about Second Life: "Shame, Really"
Students Run Wild in SL! November Road Trip: Metaplace Speed Demon! A Bubble Option For Avatars: Um, No.